Unlike most others my main work related with the conferences was much before the conference. In fact most of the work was completed more than a month ago. Firstly, the entire website was made using staticjinja. It was my first experience with staticjinja but having worked with flask, it wasn't very difficult. As one after the other keynote speakers got confirmed, I was to add there pictures and details in the website. Then after few days, I got a call from Sayan saying we need to make a registration page. I was to implement a 3 column UI with all the details. As including bootstrap only for getting it's grid help would be too much, I wrote the grid system in CSS from scratch. Which might not be a big deal for most but since it was my first time writing a grid system from scratch, I felt great when it worked. Then, apart from that was looking into the responsive UI of the website. Since no front-end framework was used, so responsiveness was also something I wrote a sketch. Yes, another happy moment for me. Then we started getting few contributors as well helping us with some of the components. So the next thing was to review and merge pull requests. Thanks to the already written grid structure, it was not much pain to make the other pages. And, obviously deploying the code to the server. It was a really great experience to be involved in the web development team of a PyCon. Conferences for me was one of the ways of spending my GSoC stipend. This time we, a group of 4 friends decided we go together, book a proper airbnb apartment and have some awesome time along with the conference. So it was also an outing for us from the college days. Conferences as I learned from PyCon India was not only for learning stuffs and listening to talks. It was more about meeting awesome people and getting to connect with them and to grow and help grow the community. So, PyCon Pune also I was eager to meet a lot of new people and to reunite with a lot of people I met before. Also, being a volunteer I had work to do. Second day was a special day because one my best friends, my ex-roommate, my project partner, Vivek Anand was going to speak for the first time in a conference about his project, Pagure with Fedora, along with Farhaan Buksh. I was super excited (and he was super nervous, I guess). And it was really good. Well, most of the things he said in talk he had already told me before but his talk didn't make me fall asleep (that's the best I can manage). After that the day was filled with sticker collection, tshirt collection, tshirt distribution, group photo and all the cool stuff associated with conferences. At the end it was all bidding goodbyes with promises to meet again on internet and in some different conference in some different place. After that, we four friends - me, Vivek, Shubham(Bhendi) and Medozonuo decided to go for a movie. Well after all The Lego Batman has hit the theaters. I know this has nothing to do with PyCon Pune but after all It's Batman. So can't help but mention. Next 2 days were devsprint. Few people were presenting their own projects. Others were contributing. I was presenting the Open Event Organizer Server project along with Medozonuo Suohu. 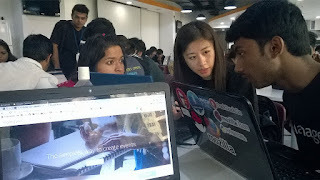 The devsprint was at Redhat office in Pune. We got some 3-4 contributors who were really excited to know about and contribute to the project. We were ourselves solving some of the bugs that we were supposed to solve while debugging installation problem on Macs (yes, we need to improve the documentation). We managed to get 2-3 Pull Requests as well which was really good because we were getting new contributors which we really needed. There were many other projects including CPython itself which got a lot of attraction. I also sat there for sometime knowing about the codebase and scopes of contribution. Sadly, I couldn't contribute to it till now. Also, there were hardware devsprints which I was interested in but also couldn't participate.